ORLANDO, Fla. -- Henrik Stenson has another chance to win at Bay Hill, and he made it a little bit tougher on Tiger Woods. Stenson, who had chances to win the Arnold Palmer Invitational presented by Mastercard two of the last three years, fought through a rugged stretch with par saves and made three birdies after the turn for a 3-under 69 on Friday. That gave him a share of the lead with Bryson DeChambeau, who had a 66. Woods wasn't nearly as sharp, didn't make a birdie until the 12th hole and shot 72. He was seven shots back. Stenson and DeChambeau were at 11-under 133. They had a two-shot advantage over PGA TOUR rookie Talor Gooch (70). Woods trailed after 36 holes in four of his eight victories at Bay Hill, including a seven-shot deficit in 2008. Henrik Stenson struggled from the start in weather that was chilly even for his Swedish blood. He made enough par putts to keep momentum, ran off three straight birdies late in his second round and wound up with a share of the lead in the Arnold Palmer Invitational. Stenson played bogey-free for a 3-under 69 and goes into the weekend with another shot at winning Bay Hill. Bryon DeChambeau also sputtered early and came on strong at the end with a 7-foot eagle putt on the 16th and an approach to 4 feet for birdie on the 18th for a 66. "I think every week I'm good enough to win or play my best," DeChambeau said. "It's just sometimes a kick here, a break here and that's just what happens." Stenson and DeChambeau were at 11-under 133. Tiger Woods played in the afternoon and went through the front nine with no birdies and two bogeys, dropping him nine shots behind. He is coming off a runner-up finish at the Valspar Championship last week and has won eight times at Bay Hill. The co-leaders had a little separation over the morning wave. PGA TOUR rookie Talor Gooch had five birdies on the back nine for a 70 and was two shots behind. Rickie Fowler (71), Billy Horschel (70) and Luke List (67) were five shots behind. Rory McIlroy again was slowed, this time by a pair of bogeys to start his back nine, and he shot 70. He was six shots behind, along with Ernie Els (70). "Henrik has played great," McIlroy said. "I'm going to have to play very, very good golf on the weekend to catch him, but I'm in a better position this Friday than I was last Friday, so I'll take anything I can get." McIlroy missed the cut last week. So did Stenson, in his first tournament after a month break. He opened with a 64 in the warm afternoon, and then faced temperatures around 50 when he teed off Friday morning. Never mind that he grew up in Sweden. The former Open champion now lives in Orlando, and this was the kind of morning when ordinarily he would have a few cups of hot chocolate and wait until it got warmer to play. "I might be Swedish, but I've gone soft," he said. "I lived in a nice climate for too many years." He had only two birdie chances inside 30 feet on the back nine (he started on No. 10), and those were from 18 feet. And then his round nearly got away from him on the par-5 16th when he chunked a shot from the fairway bunker, pitched some 70 feet beyond the hole and had to make an 8-footer for par. He had to make a 15-foot par save after hitting into the bunker on No. 17, and he saved par from the bunker left of the 18th green by holing a 5-foot putt. 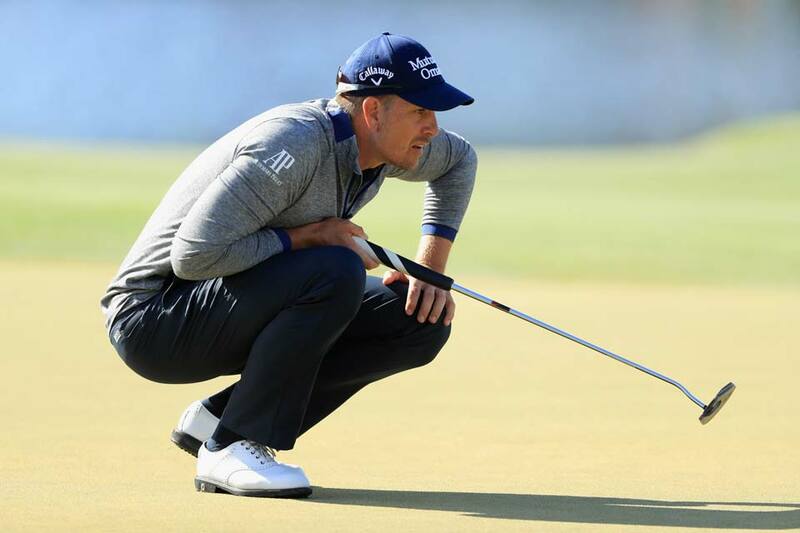 "It could have easily been two or three, even three bogeys on those three holes and got away with pars on those and stayed patient and played a bit better coming in and racked up three birdies in a row," Stenson said. "So 3 under, I'm pretty pleased with that. It wasn't maybe as beautiful as it was yesterday, but still a solid round."